The northerly location of Geilo as with most of the Scandinavian ski resorts gives it a good long snow sure season. 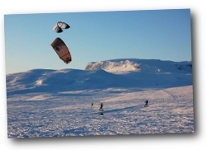 The Ski season in Geilo runs from late November through to early May. The extensive flood lighting in Geilo helps to keep the resort open during the short days of December and January. Geilo ski resort is made up of 40 runs and 3 snow parks that are serviced by a good network of 18 lifts. Geilo has a good mix of terrain and difficulty levels to ensure that there is something for everyone. The 40 runs are made up from 10 green, 10 blue, 15 red and 5 black and are housed across 4 ski centres. There are plenty of other activities in and around Geilo to keep everyone entertained, from those who are just not into the downhill side of things to those looking for a day off the slopes.